We are constantly betraying the Gospel commandments, reckoning them as nothing, but for some reason thinking that were some special trial to befall our lot – such as that which befell the Forty Martyrs of Sebastia – that we would show steadfastness, because we would recognize that in this case it is clearly a matter of salvation or perdition, of confessing Christ or of denying Him. Today, brothers and sisters, we have all assembled in order to honor the memory of the Forty Martyrs of Sebastia. They suffered at a time when the Christian faith seemed to have already begun to triumph over the entire Roman Empire and when the Emperor Constantine the Great, having defeated many of his opponents, had become the patron of Christianity. It was during this time that Licinius, one of Constantine’s former allies, resisted his authority and desired to reign independently, although he was only intended to be co-regent. Licinius, knowing that the Emperor Constantine was showing patronage to Christianity, and evidently fearing that sympathy for him might arise among his troops, began to demand that they renounce Christ. At the very time that the Christian world was ready to celebrate the end of persecution, forty soldiers, whom we know as the Martyrs of Sebastia, were unexpectedly required to suffer for Christ. This alone, one must suppose, was especially agonizing for them, since persecution and torment suddenly befell them just as they were expecting calm. They were ordered, first gently and then threateningly, to renounce Christ; but they, who had demonstrated their courage on the battlefield, now acted courageously in their battle against the devil, remaining steadfast in the face of threat. There were quite a few of them: forty men, nearly half of a so-called Roman century, a division of the Roman army made up of 100 men. They were subjected to terrible torture: they were forced into a lake covered with ice and not allowed to go ashore. Here they were required not simply to endure, but to remain for a long time in a condition contrary to human nature, all the while showing resilience and longsuffering. They remained stripped naked all night; and in order both to tempt them and to aggravate their already superhuman agony – since human beings cannot endure cold for long, much less while in freezing cold water; they ultimately lose control of themselves – the tormentors placed a heated bathhouse on the bank of the lake so that each soldier could see that at any moment he could leave the lake and immediately warm his frozen body, if only he would deny Christ. They all remained steadfast, except for one. This one could not endure it, denied Christ, and went to the bathhouse, but fell dead on the threshold, as he is sometimes depicted on icons. A short time later, one of the guards saw that Divine light shone in the sky above the suffering soldiers in Lake Sebaste and that forty crowns had begun to descend upon them. One crown, intended for the soldier who had renounced Christ, began to rise back to the sky. Then the guard, whose name was Aglaius, declared himself to be a Christian, removed his clothing, and went into the lake in order to suffer along with the martyrs. By the grace of God, the soldiers remained unscathed. When morning came they were killed in a terrible, awful way: their bones were crushed with hammers. Thus were they killed. 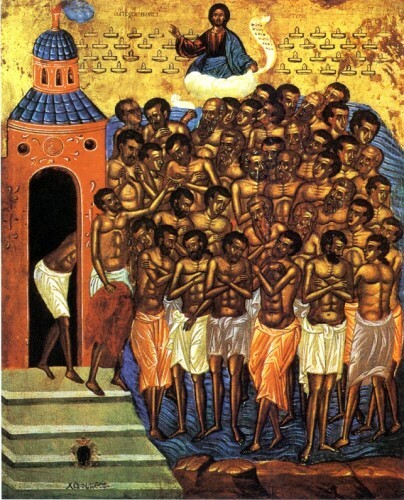 The martyrs’ bodies were burned and their bones thrown into the water. The following day Christians gathered up their bones. From that day forward the entire world began to venerate the memory of these martyred warriors of Christ. You know that this is one of the few feast days that is especially singled out during Great Lent, because we bow down before the longsuffering of these men. 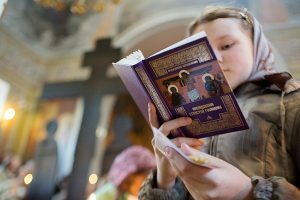 A variety of traditions exists within the Orthodox Church. 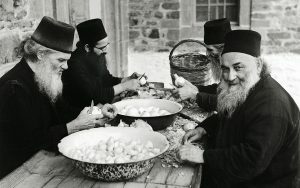 In Russia, for instance, some saints are called “martyrs,” others are called “venerable ones,” and others are called “holy hierarchs,” while in the Greek Church they are all simply called “saints.” We normally call those who suffered for Christ “martyrs” or “passion-bearers,” while the Greeks, following ancient tradition, call them “witnesses,” because they believe that one who has endured such martyrdom, thereby showing extraordinary and superhuman courage, is a witness to the truth of the Orthodox confession of faith and of the Orthodox Church. For how else but by one’s life can one prove one’s case? If we were to embark on studies, arguments, and debates, and come out victorious, surpassing all others by our intelligence, yet all the while showing cowardice in our actions, then we would have shown that we ourselves are not in fact convinced, or that we hold only common human convictions that, for reasons of fear or trouble, can be forgone out of a sense of self-preservation. It is for this reason that martyrs are called witnesses: by their own lives and struggles they demonstrate more convincingly than any apologist or theologian the truth of Christianity. What helped them in accomplishing this? What did they have that we lack? History itself offers us an explanation, especially the history of the suffering of the Forty Martyrs of Sebastia. We see that after they had shown their longsuffering, a supernatural Divine light suddenly appeared, shining upon them and even warming the air. But the main thing is not the warming of the air and water that the martyrs were in, but that God’s grace, this Divine light, penetrated their souls and hearts and, as it were, began to shine forth from within them, thereby rendering them capable of bravery beyond nature. God’s grace gave them the strength to endure that which exceeds the capabilities of not only the ordinary person, but even of an especially strong spirit and, as we have just said, of a person of strong will. It is namely God’s grace that makes us capable of performing that which is beyond nature. It helps us to endure all the afflictions that our enemy, the devil, has in store for us to turn us away from the true path. Sometimes these afflictions are indeed terrible, as for instance those that befell the Martyrs of Sebastia or the New Martyrs and Confessors of Russia, who suffered in recent years. But sometimes the devil uses small afflictions and troubles, not requiring of us an explicit renunciation of Christ, but nonetheless imperceptibly compelling us to behave in an un-Christian manner. But we, underestimating the importance of these seemingly minor occurrences, sin much and often – and in fact, as deplorable and terrible as this may sound, we are apostates. We are constantly betraying the Gospel commandments, reckoning them as nothing, but for some reason thinking that were some special trial to befall our lot – such as that which befell the Forty Martyrs of Sebastia – that we would show steadfastness, because we would recognize that in this case it is clearly a matter of salvation or perdition, of confessing Christ or of denying Him. But the devil tempts us through many small things: small, insignificant, minor incidents; mild afflictions; small temptations. We do not take care to have God’s grace always present in us; we do not acquire it by increased prayer, repentance, and the painstaking fulfillment of our Christian duty, that is, through participation in the divine services, fasting, and so on. We ignore the necessity of forcing ourselves to fulfill the commandments, remaining in negligence, neglect, and carelessness. Thus, we lose the grace that we received in the Mystery of Baptism and that we receive in the Mysteries of Confession and Communion, thereby rendering ourselves powerless over the countless machinations of the devil. Today they are small, but who know what tomorrow will bring? Let us recall a time that, from the standpoint of history, is relatively recent. Until 1917, Russia was a prosperous, wealthy, and great country, in which people lived comfortably, clergy and monastics included. Russia was flourishing and, according to the prognosis of Pyotr Arkadyevich Stolypin, promised to become a great power in economic terms, perhaps such as the Unites States is today. However, people fell into carelessness, began to neglect the Gospel commandments in small ways, and were deprived of God’s grace. The Lord allowed a terrible social scourge to seize our country. And those very people who thought they were living in a Christian country, that thought they had not committed any grave sins – and if they had sinned, had repented – showed cowardice and weakness, betraying their Sovereign, their Motherland, and the Orthodox Church. Very, very many people behaved treacherously to their neighbors. During the time of persecution many people fell away from the Church, while others renounced their sacred office – not only priests, but also monastics and bishops. Of course, there were many brave people – confessors and martyrs – but there was an even greater number of cowardly people. 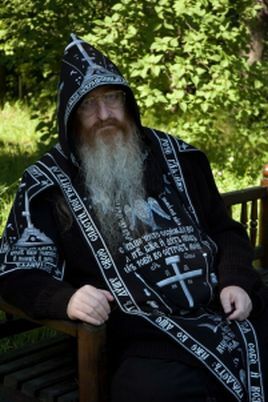 They were unable to endure their trials because they did not have God’s grace, the acquisition of which, in the words of St. Seraphim of Sarov, is the goal of Christian life. Indeed, we take trouble to acquire property and to ensure the welfare of ourselves and of our loved ones, considering this our duty. Why, then, are we negligent in acquiring God’s grace? Why do we make ourselves defenseless and empty? Due to our personal weaknesses and our limited human capacities, we naturally cannot resist every temptation and affliction that the devil raises against the Orthodox Church. But the Church is you and I – it is neither the walls of the church, nor the hierarchy, nor the ecclesiastical administration. The Orthodox Church is every Orthodox person, whoever he may be, whether laymen, monk, priest, or bishop. And if the devil is leveling such persecution against the Church that the Savior Himself compared it to the gates of hell (cf. Matthew 16:18), then how watchful and sober must we be! How must we labor for the acquisition of Divine help, which is above nature, in order to stand fast against everything that the devil levels against us, wishing to tear us away from the Church and to destroy us! But so long as we are united to the Church, nothing can defeat us. This is what distinguishes martyrs from all other people. Both the martyrs of the fourth century, such as the soldiers who suffered in Lake Sebaste, and the martyrs of the twentieth century, who suffered in camps and exile; both those whose bones were crushed with hammers, and those who were shot with revolvers and pistols – they all had the same advantage over us: they had the grace of God. This is what elevates man above his own nature. Let us not grow negligent, reassuring ourselves that now everything is just fine. We do not know what trials await each one of us. Perhaps the temptations we face will make us prefer to suffer some incurable illness and physical suffering rather than have our souls succumb to sinful impulses we are powerless to resist. Therefore, let us not be negligent; let us pray day and night; let us strive with all our strength and at all times to force ourselves to be with God, with the grace of God. The Lord sees our intentions and sees our hearts. In return for our humility, repentance, and forcing of ourselves, He protects us from all spiritual and bodily afflictions – although this does not mean that we will live comfortably and successfully. May the Lord grant us steadfastness, courage, and faith, that in time of temptation we might act as true Christians. Amen. Delivered on March 22, 2003, at the Novo-Tikhvin Women’s Monastery in Ekaterinburg, of which Fr. Avraam is the spiritual father. Pyotr Arkadyevich Stolypin (1862-1911) was appointed Prime Minister by the Tsar Nicholas II in 1906. He was fatally shot by a political radical in Kiev on September 14, 1911, in the presence of the Tsar and his two eldest daughters. Immediately after being shot Stolypin cried out “I am happy to die for the Tsar” and blessed the Tsar-Martyr with the sign of the cross.